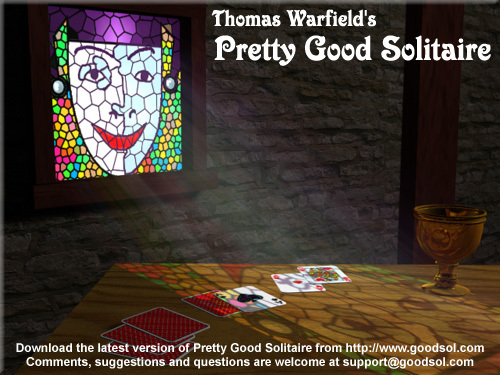 Yesterday, Goodsol Development published Pretty Good Solitaire Mac Edition 2.30, the latest version of the premier computer Solitaire program for Apple Mac OS X. Pretty Good Solitaire Mac Edition 2.30 adds 50 new solitaire games, bringing the total to 350 games in the trial version, and 400 games in the full version (with 50 bonus games). This game also introduces the Tour Explorer, which allows players to play game tours for a total score in pursuit of the perfect tour. Click here for a list of other features in PGSME. You can download a trial version of the product and buy it for only $24.95! This version is a free upgrade for all previous PGSME customers, and new customers will get free upgrades through the end of 2012, which will include even more releases and new games. As mentioned in my 2011: Year in Review article, this product is the culmination of a fairly long development and beta test cycle. Surprisingly, the game tours feature (like the game groups before it) was the biggest single issue in getting the product released sooner. Not only does the feature consist of four separate dialog boxes, plus two more back-end data classes, but the only specification was a somewhat flawed implementation, so I needed to rethink and redesign the entire feature, and then tweak the behavior until we had something that worked well. Complicating matters was the fact the beta testers were not inclined to play game tours, and none are quality assurance professionals (nor aspiring to be), so in essence, only we developers (mostly me) were doing any real testing of this feature. Of course, the sheer mass of 50 new games, when combined, contributed much more to the overall development and testing time, though none (even the real “oddballs”) took a huge amount of time alone. Fortunately, our beta testers were more meticulous about play testing individual games, so the few significant bugs I let slip through to the beta versions were (hopefully) identified and crushed. I challenge anybody to find a bug in PGSME now. After a short breather, I will be back on development of PGSME 2.4 (a.k.a., GS400), which will contain (surprise!) another 50 games for a total of 400 (plus at least 50 bonus games). Bring it on!